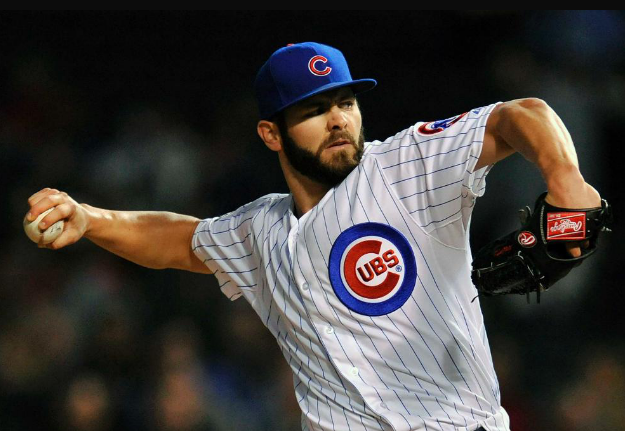 Jake Arrieta took a no hitter into the 8th and finished with a complete game 1 hit, 1 walk, thirteen strikeout masterpiece of the Reds, giving the Cubs a 7-0 shutout. Wilmer Flores doubled and homered twice, scoring 3 times and driving in 6, leading the Mets offense in a 9-1 drubbing of the Marlins. Ricky Nolasco kept the mighty Tigers off the board with 8 shutout innings, allowing 5 hits and 1 walk. He would get a no decision as the bullpen blew the lead but the Twins would come back to win, 4-3. Adam Eaton went 4-5, missing the cycle by a homer, and scored a pair of runs as the White Sox frustrated the Royals, 7-5. They all owned baseball on Sept 16, 2014. Lance Lynn went 7 innings allowing 1 run, 5 hits and 1 walk. The Brewers would tie the game in the 9th and beat the Cardinals in the 12th, 3-2. Freddy Galvis reached base 3 times, including a homer, drove in a pair and scored a pair including a run in the 9th but the Phillies rally fell short in San Diego, 5-4. J.D. Martinez got on base 3 times and launched a 2 out, top of the 9th, go ahead 3 run homer. The Tigers bullpen would surrender that lead and lose 4-3 in Minnesota. Rick Porcello pitched 8 strong innings, allowing just 2 runs and was in line for the come from behind win. But Detroit’s bullpen was the culprit again and the Twins walked off 4-3 winners. Arismendy Alcantara, Nori Aoki, Oswaldo Arcia, Bronson Arroyo, Erick Aybar, Javier Baez, Jackie Bradley Jr., Jay Bruce, Matt Carpenter, Chris Carter, Santiago Casilla, Nick Castellanos, Shin-Soo Choo, Hank Conger, Kevin Correia, Collin Cowgill, Brandon Crawford, Coco Crisp, Michael Cuddyer, Khris Davis, Ike Davis, Randall Delgado, Chris Denorfia, Odrisamer Despaigne, Ian Desmond, Matt Dominguez, Andre Ethier, Mike Fiers, Wilmer Flores, Gavin Floyd, Sam Fuld, Kyle Gibson, Alex Gonzalez, Carlos Gonzalez, Gio Gonzalez, Miguel Gonzalez, Brandon Guyer, J.A. Happ, Dan Haren, Ryan Howard, Torii Hunter, Edwin Jackson, Howie Kendrick, Jason Kipnis, Colby Lewis, Adam Lind, Francisco Liriano, Jordan Lyles, Manny Machado, Russell Martin, Tyler Matzek, John Mayberry Jr., Jordy Mercer, Tommy Millone, Rafael Montero, Kendrys Morales, Justin Morneau, Donnie Murphy, Wil Myers, Juan Nicasio, Hector Noesi, Lyle Overbay, Chris Owings, Jimmy Paredes, James Paxton, Brad Peacock, Glen Perkins, Yusmeiro Petit, David Phelps, Yohan Pino, Drew Pomeranz, Martin Prado, Rene Rivera, Brian Roberts, Shane Robinson, Stefen Romero, Wilin Rosario, Robbie Ross Jr., Carlos Ruiz, Anibal Sanchez, Hector Sanchez, Ervin Santana, Hector Santiago, Jordan Schafer, Jonathan Schoop, Alfredo Simon, Justin Smoak, Travis Snider, Yangervis Solarte, Denard Span, Dan Straily, Eugenio Suarez, Nick Swisher, Nick Tepesch, Josh Tomlin, Dan Uggla, Kennys Vargas, Michael Wacha, Tsuyoshi Wada, Jerome Williams, Chris Young, Delmon Young, Eric Young Jr.
Matt Adams, Yonder Alonso, Brett Anderson, J.P. Arencibia, Mike Aviles, Jeff Baker, Scott Baker, Trevor Bauer, Gordon Beckham, Gregor Blanco, Mike Bolsinger, Peter Bourjos, Lorenzo Cain, Alberto Callaspo, Chris Capuano, Scott Carroll, Francisco Cervelli, C.J. Cron, Brandon Cumpton, David DeJesus, Daniel Descalso, Jake Diekman, Sean Doolittle, Ryan Doumit, Adam Dunn, Ryan Flaherty, Kevin Frandsen, Nate Freiman, Freddy Galvis, Avisail Garcia, Ken Giles, Conor Gillaspie, Jonny Gomes, Yan Gomes, Didi Gregorius, Brad Hand, Bryce Harper, Andrew Heaney, Jeremy Hellickson, Dilson Herrera, Derek Holland, David Holmberg, Nick Hundley, Raul Ibanez, Ender Inciarte, Chris Johnson, Kevin Kiermaier, George Kottaras, Jason Kubel, Juan Lagares, Evan Longoria, Nate McClouth, Jordy Mercer, Miles Mikolas, Yadier Molina, Jimmy Nelson, Jonathan Papelbon, Chris Parmelee, Cliff Pennington, Jhonny Peralta, Michael Pineda. Jose Ramirez, Colby Rasmus, Todd Redmond, Alex Rios, Jarrod Saltalamacchia, Gaby Sanchez, Danny Santana, Michael Saunders, Skip Schumaker, Jean Segura, Eric Stults, Kurt Suzuki, Justin Turner, Danny Valencia, Jonathan Villar, Zach Walters, Tony Watson, Jayson Werth, Ryan Wheeler, Josh Willingham, Tom Wilhelmsen, Chris Young, . Posted on September 17, 2014, in 'SullyMetrics' and tagged 2014 WOB Leaders for American League Hitter, 2014 WOB Leaders for American League Pitcher, 2014 WOB Leaders for the National League Pitcher, a.j. pierzynski, a.j. pollock, aaron harang, adam dunn, Adam Eaton, adam jones, adam laroche, adam lind, adam wainwright, adeiny hechavarria, adrian beltre, adrian gonzalez, albert pujols, alberto callaspo, alex cobb, alex gonzalez, alex gordon, alex ríos, alex wood, alexei ramirez, alfredo simon, allen craig, andre ethier, Andrew Cashner, Andrew Heaney, Andrew McCutchen, angel pagan, anibal sanchez, anthony rendon, anthony rizzo, aramis ramirez, Arismendy Alcantara, asdrubal cabrera, avisail garcia, bartolo colon, ben revere, ben zobrist, billy butler, BIlly Hamilton, brad hand, brad peacock, brandon belt, brandon crawford, Brandon Cumpton, Brandon Guyer, brandon mccarthy, brandon moss, Brandon Workman, brayan pena, brett anderson, brett gardner, Brett Oberholtzer, Brian Dozier, Brian McCann, brian roberts, brock holt, Bronson Arroyo, bryce harper, bud norris, buster posey, c.j. cron, c.j. wilson, carl crawford, carlos beltran, Carlos Carrasco, carlos gomez, carlos gonzalez, carlos ruiz, carlos santana, casey mcgehee, charlie blackmon, charlie morton, chase utley, chris archer, chris carter, chris davis, chris denorfia, chris johnson, Chris Owings, Chris Parmelee, chris sale, chris tillman, chris young, christian yelich, clay buchholz, clayton kershaw, cliff lee, cliff pennington, coco crisp, Cody Asche, colby lewis, colby rasmus, cole hamels, collin cowgill, collin mchugh, Conor Gillaspie, Corey Dickerson, Corey Kluber, curtis granderson, dallas keuchel, dan haren, dan straily, dan uggla, Daniel Descalso, daniel murphy, Danny Duffy, Danny Salazar, danny santana, danny valencia, david Dejesus, David Holmberg, david murphy, david ortiz, David Peralta, david phelps, david price, david wright, dayan viciedo, dee gordon, delmon young, denard span, Derek Holland, derek jeter, derek norris, desmond jennings, devin mesoraco, Dexter Fowler, didi gregorius, dillon gee, dilson herrera, Donnie Murphy, doug fister, drew hutchison, drew pomeranz, Drew Smyly, Dustin Ackley, dustin pedroia, edinson volquez, eduardo escobar, eduardo nunez, edwin encarnacion, edwin jackson, emilio bonifacio, Ender Inciarte, eric hosmer, eric stults, Eric Young Jr. Guys Who Owned Earned 1/2 A WOB 2014 MLB, erick aybar, ervin santana, eugenio suarez, evan gattis, evan longoria, felix hernandez, francisco cervelli, francisco liriano, freddie freeman, gaby sanchez, garrett richards, gavin floyd, george kottaras, george springer, gerardo parra, gerrit cole, giancarlo stanton, gio gonzalez, glen perkins, gordon beckham, grady sizemore, Gregor Blanco, Gregory Polanco, Guys Who Owned Baseball For One Day In 2014 MLB, hank conger, hanley ramirez, hector noesi, Hector Sanchez, hector santiago, henderson alvarez, hiroki kuroda, hisashi iwakuma, homer bailey, howie kendrick, hunter pence, Hyun-Jin Ryu, ian desmond, ian kennedy, ian kinsler, ike davis, j.a. happ, j.d. martinez, j.p. arencibia, Jackie Bradley Jr., Jacob DeGrom, jacoby ellsbury, jake arrieta, jake diekman, jake odorizzi, jake peavy, james loney, james paxton, james shields, jarred cosart, jarrod saltalamacchia, jason castro, jason hammel, jason heyward, jason kipnis, jason kubel, Jason Vargas, Javier Baez, jay bruce, jayson werth, jean segura, jedd gyorko, Jeff Baker, jeff locke, jeff samardzija, jered weaver, Jeremy guthrie, jeremy hellickson, jerome williams, jesse chavez, Jesse Hahn, jhonny peralta, Jimmy Nelson, jimmy paredes, jimmy rollins, joe mauer, joey votto, john danks, john jaso, john lackey, john mayberry Jr., johnny cueto, jon lester, jonathan lucroy, jonathan papelbon, Jonathan Schoop, Jonathan Villar, Jonathon Niese, jonny gomes, jordan lyles, jordan schafer, jordan zimmermann, Jordy Mercer, jorge de la rosa, jorge soler, jose abreu, jose altuve, jose bautista, jose fernandez, jose quintana, jose reyes, josh beckett, josh collmenter, josh donaldson, josh harrison, josh reddick, Josh Tomlin, josh willingham, juan lagares, juan nicasio, juan uribe, julio teheran, justin masterson, justin morneau, justin ruggiano, justin smoak, justin turner, justin upton, justin verlander, Ken Giles, kendrys morales, Kennys Vargas, kevin correia, kevin frandsen, Kevin Kiermaier, Khris Davis, kole calhoun, kurt suzuki, kyle gibson, kyle lohse, kyle seager, lance lynn, leonys martin, logan morrison, lonnie chisenhall, lorenzo cain, lucas duda, luis valbuena, lyle overbay, madison bumgarner, manny machado, marcell ozuna, mark buehrle, mark reynolds, mark trumbo, marlon byrd, martin perez, martin prado, masahiro tanaka, mat latos, Matt Adams, matt cain, matt carpenter, matt dominguez, matt garza, matt holliday, matt kemp, Matt Shoemaker, max scherzer, melky cabrera, michael brantley, michael cuddyer, Michael Morse, Michael Pineda. Jose Ramirez, Michael Saunders, michael wacha, miguel cabrera, miguel gonzalez, miguel montero, mike aviles, Mike Bolsinger, mike fiers, Mike Leake, mike minor, Mike Trout, mike zunino, miles mikolas, nate freiman, nate mcclouth, nathan eovaldi, neil walker, nelson cruz, nick castellanos, nick hundley, nick markakis, nick swisher, Nick Tepesch., nolan arenado, nori aoki, Odrisamer Despaigne, omar infante, oswaldo arcia, pablo sandoval, paul goldschmidt, pedro alvarez, peter bourjos, phil hughes, r.a. dickey, Rafael Montero, rajai davis, randall delgado, raul ibanez, Rene Rivera, rick porcello, ricky nolasco, Robbie Ross Jr., roberto hernandez, robinson cano, Roenis Elias, Rougned Odor, rubby de la rosa, russell martin, ryan braun, ryan doumit, ryan flaherty, ryan howard, ryan ludwick, Ryan Volgelsong, ryan wheeler, ryan zimmerman, salvador perez, sam fuld, santiago casilla, scooter gennett, scott baker, Scott Carroll, scott feldman, scott kazmir, scott van slyke, sean doolittle, seth smith, Shane Robinson, shelby miller, shin-soo choo, Skip Schumaker, sonny gray, starlin castro, starling marte, Stefen Romero, stephen strasburg, steve pearce, Tanner Roark, tim hudson, tim lincecum, todd frazier, todd redmond, tom koehler, tom wilhelmsen, tommy millone, tony watson, Torii Hunter, travis d'arnaud, travis snider, travis wood, trevor bauer, trevor plouffe, troy tulowitzki, tsuyoshi wada, Tyler Flowers, Tyler Matzek, tyler skaggs, tyson ross, ubaldo jimenez, vance worley, victor martinez, Vidal Nuno, wade miley, wil myers, wilin rosario, Wilmer Flores, wily peralta, xander bogaerts, yadier molina, yan gomes, Yangervis Solarte, yasiel puig, yoenis cespedes, Yohan Pino, yonder alonso, Yordano Ventura, yovani gallardo, yu darvish, yunel escobar, yusmeiro petit, zach walters, zack greinke, zack wheeler. Bookmark the permalink. 2 Comments.